SUPERIOR PERFORMANCE! 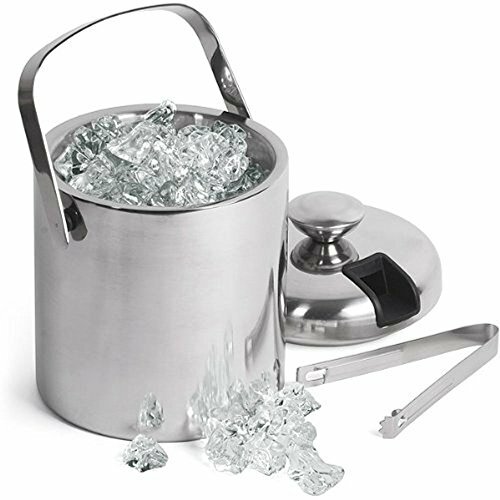 This stand alone double walled ice bucket has 5.5 x 5.5 inch capacity without the removable lid. Attach the lid for the ability to carry and handle your ice and beverages with one hand - PERFECT for home Mini Bar parties, event gatherings, even RVs and Boats! PRACTICAL. The Special lid with custom tongs and convenient handle is designed and manufactured to precisely fit the GSCW very tightly and secure. QUALITY! Comes with an elegant bin Strainer, allowing you to keep any ice you need dry the easy way - make any cocktail drink now without any water exposure or drip melt. Elegance at its finest. UNIQUE! Holds up to 1.3L or over 40 oz of Ice. You will have plenty of ice ideally for 2 people - just like the pros do.